To Brandanger on the "Ships starting with B" page. Source: Historical Department, MAN B&W Diesel, Copenhagen - (see their museum website, external link). They also sent me this photo from her launching. Uboat.net has another picture of Brandanger - external site. A picture is also available on this external page (click in it to enlarge). Tonnage: 4624 gt, 2765 net, 8600 tdwt. Delivered in June-1926 from Burmeister & Wain's Maskin & Skibsbyggeri A/S, Copenhagen, 380' x 53.6' x 28.3'. (Archive doc gives arrival London June 9). See ships in HX convoys. According to the archive document, Brandanger was on her way from Seattle to Anwerp and Rotterdam when war broke out in Norway on Apr. 9-1940, but was diverted to London. She had left Seattle on March 30 and stopped in San Francisco, Los Angeles and Balboa, before proceeding to Bermuda. She was scheduled for the Bermuda portion of Convoy HX 41, which left on May 7 (she did not arrive Bermuda until May 8), but instead joined the next convoy on May 11, BHX 42, which joined up with the main convoy from Halifax on May 17 (HX 42 had departed Halifax on May 12) - follow the link for convoy details, several Norwegian ships took part. As will be seen Brandanger, cargo of lumber and wheat for Falmouth in station 56, had a Norwegian ship on each side of her, namely Solstad and Petter, all 3 having joined from Bermuda. According to the Commodore's notes, she was slow in answering and repeating signals (as was Petter). Brandanger arrived Falmouth on May 26, and via Weymouth Bay, she later arrived London on June 9. Later that month she joined Convoy OA 175, which departed Southend on June 27 and dispersed on July 1. Her destination is given as Panama, station 22. Ref. external link provided in the table above, as well as my own page related to this convoy (Vice Commodore's report). A. Hague has also included the Norwegian Boreas, Leikanger and Topdalsfjord in this convoy (his listing is incomplete), while another section of the same site also names Audun (to Southampton only) and Sevilla (to Falmouth). Brandanger arrived Cristobal on July 17, then continued to Los Angeles - again, see the archive document. More information on the other Norwegian ships named here can be found via the alphabet index at the end of this page, or go to the Master Ship Index. 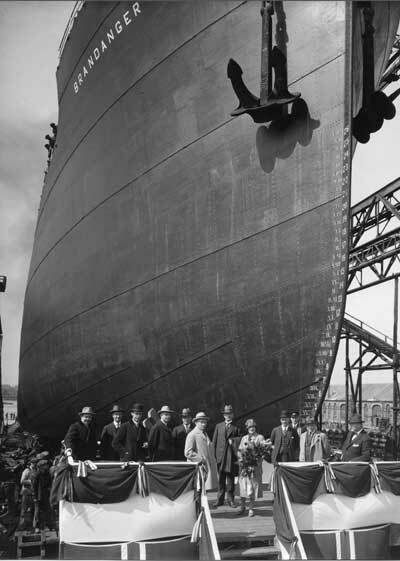 Brandanger had taken on board about 8000 tons general cargo (including lumber and metals) in San Pedro (California) for Liverpool, before departing on Sept. 4-1940, arriving Balboa on Sept. 17 for bunkers, then left again the following day, anchoring at Cristobal that same evening. On Sept. 19, she proceeded to Bermuda, in order to join a convoy to the U.K. She arrived Bermuda in the afternoon of Sept. 26 (see archive document), departing on Sept. 28 in Convoy BHX 77, which joined up with the main convoy from Halifax on Oct. 3 (departure Halifax Sept. 30). This convoy is not yet available among the HX convoys included on my website, but will be added; see ships in all HX convoys. The Norwegian Dagrun, Davanger (sunk by U-48 - follow the link for details), Emma Bakke, Heina and Samnanger are also listed in HX 77. Brandanger had station 76. On Oct. 11-1940, she was struck in the engine room on the port side by a torpedo from U-48 (Bleichrodt), position 57 02N 17 42W (Jürgen Rohwer gives the position as 57 10N 17W for Brandanger's demise). The engine stopped and the lights went out, the entire midships section was destroyed and the lifeboats on the port side were blown away. The crew ran to the starboard boats, but while launching the motorboat it was crushed against the side of the ship and the 5 who were in it fell in the water. 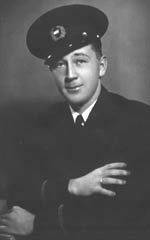 They were 1st Engineer Olaf Andreas Larsen, 3rd Mate Erling Skålvik, Electrician Obert Bjelland, Mess Boy Øistein Jørgensen and Ordinary Seaman Nikolai Kaursland; only the latter survived. (Brandanger's other 2 casualties, Assistant Osvald Torgersen and Mechanic Wilhelm Hagen were on duty in the engine room and were believed to have been killed in the explosion). Another boat manned by the 2nd mate and 13 men was successfully launched, as was a 3rd boat manned by the 1st mate and 6 men. Captain Andersen and Carpenter Sigurd Svendsen had assisted in lowering this boat, and as the line was cut the boat rowed away, leaving the 2 men behind on the sinking ship. The captain and carpenter drifted clear on a raft as Brandanger sank about 20 minutes later. They were picked up early the next morning by the corvette HMS Clarkia, as were the 14 in the 2nd mate's boat, and landed in Liverpool on Oct. 15. Meanwhile, the 1st mate's boat kept rowing and sailing in the heavy seas with course for Ireland, until they were finally found in the afternoon of the 16th by S/S Clan MacDonald (Captain A. Mackinley) in 54 09N 13 28W, and landed in Liverpool on the 19th. This boat had picked up Ordinary Seaman Kaursland about half an hour after he had fallen out of the ruined motorboat. (According to a report presented at the subsequent maritime hearings, the 1st mate's boat had encountered 2 other lifeboats with people in it in the afternoon of Oct. 12 - no further details as to which ship they may have come from). Arnold Hague lists 6 ships lost in HX 77, namely Pacific Ranger (no casualties), Port Gisborne (26 dead), Saint Malo (28 dead) and Stangrant (9 dead), as well as Brandanger and Davanger, and says the convoy arrived Liverpool Oct. 15. See the external link at the end of this page for more on these attacks. The maritime hearings were held in Liverpool on Oct. 25-1940 with the captain, the 1st mate, the 2nd mate (on duty on the bridge), the 2nd engineer, the carpenter, Able Seaman Garmann, Ordinary Seaman Kaursland (at the wheel), and Able Seaman Vebenstad appearing. Captain Andersen later joined Rio Branco, Gunvor and Rita. I need to mention some conflicting information here, arising from 3 different statements at the maritime hearings, one by the 2nd mate, one in the captain's report (though he does not name the ships), and again in a report written by the 1st mate who says that before Brandanger was torpedoed they had received 2 radio reports about ships having been torpedoed in the convoy, one being the Norwegian Emma Bakke, the other Port Gisborne. As already mentioned, Emma Bakke is listed in this convoy, but I've never seen mention of her being torpedoed at any time, nor is this mentioned anywhere by J. Rohwer. Even if we assume this is a mix up with Davanger, there's still another reason why the statements seem off, namely the fact that Brandanger appears to have been the first ship to be torpedoed in this convoy, followed about 20 minutes later by Port Gisborne, then another 2 hours passed before the Norwegian Davanger was hit (this according to Rohwer's "Axis Submarine Successes of World War Two"). "Nortraship's flåte" states that U-48 sank Davanger first, then a British ship 20 minutes later, before hitting Brandanger. For info, U-48 was also responsible for the attack on Tudor earlier that year - follow the link for details. This is 2nd Mate Henry Sørensen. After Brandanger was sunk he joined the Swedish D/S Sir Ernest Cassel (sunk by German Thor), and was the 2nd mate of M/S Fernlane when that ship was torpedoed in 1941. 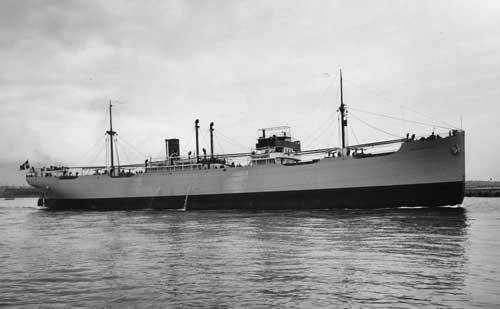 He later sailed with M/T Gard until 1943, and M/T Dalfonn till 1945. (After the war he served on Eidanger [ex Cape Sebastian] among others). (Picture received from his son, Hans Jacob Herholdt). Stavern Memorial commemorations - In addition to the 6 that I've listed above, there's a 1st Mate Laurits Sørensen commemorated at this memorial for seamen in Stavern. I believe this is a mix-up with M/S Brand, which was sunk on May 12-1943. Brand had a 1st mate by this name. Back to Brandanger on the "Ships starting with B" page. Westfal-Larsen later had another ship by this name, delivered in March-1949, built in Sunderland. Sold in June-1965 to Lichtenstein and renamed Alkaid (registered in Bulgaria). Sold in 1971 and renamed Peter Beron (of Bourgas). The text on this page was compiled with the help of: "Nortraships flåte", J. R. Hegland, "The Allied Convoy System", Arnold Hague, "Axis Submarine Successes of World War Two", Jürgen Rohwer, "Sjøforklaringer fra 2. verdenskrig", Volume I (Norwegian Maritime Museum), and misc. others for cross checking info. - ref My sources. The Voyage Record was received from Tony Cooper, England - His source: Public Records Office, Kew.